On 1 July 2015, another meeting of the CAM Interest Group took place, hosted and chaired by MEP Sirpa Pietikäinen (Finland). In several EU Member States, the availability of CAM herbal, homeopathic, and anthroposophic medicinal products is unnecessarily restricted, a fact confirmed by a recent report by Matrix Insight, commissioned by DG Health and Food Safety. The lack of availability of these products inhibits an increasing demand by EU citizens for low risk, health-enhancing CAM medicines, hampering the ability of doctors and practitioners to deliver CAM treatments effectively. It also undermines the potential benefit of these products in helping to tackle health issues prioritised by the Commission e.g. combating anti-microbial resistance, managing chronic conditions and sustaining healthy ageing. Urgent measures are now needed to increase the availability of these products across the EU. 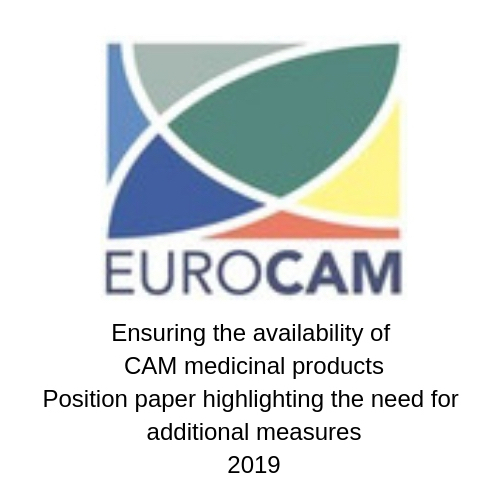 Experts from the CAM community outlined issues that limit the availability of CAM medicinal products, presenting proposals for positive action within the current legal framework in order to improve their accessibility. Ton Nicolai MD, EUROCAM spokesman/coordinator. René de Winter MA, President, European Federation of Patients' Associations for Anthroposophic Medicine. Herbert Schwabl PhD, Board member DaKoMed - Swiss Umbrella Organisation of Complementary Medicine. Stephen Gordon MCH RSHom FSHom, General Secretary, European Central Council of Homeopaths. Madeleen Winkler MD, Vice-President, International Federation of Anthroposophic Medical Associations (IVAA). Letter to Commissioner Vytenis Andriukaitis signed by several members of the European Parliament.